The new stadium is where it is. Let's do it right by incorporating mixed-use facilities that enhance the public realm, increase accessibility and bring the community together. As Hamilton's new stadium construction slowly comes down the home stretch, its time to look at maximizing the development and community potential in the surrounding blocks slated for various forms of demolition and development. Love it or hate it, this is our new stadium, location and all. The Hamilton Tiger-Cats and the City still have a unique opportunity to show that they are interested in leveraging some city-building with this new facility. Much has been made of the new GO Station being built near the West Harbour, which would have had a platform literally at the stadium entrance. When the Cats last took a poll of their ticket-holders, convenient transit access was ranked very high among respondents and their wishes for a new facility. Hamilton's first planned light rail transit (LRT) line has a proposed station literally at the front entrance to the stadium. How great would it be for Mountain, Dundas and Stoney Creek residents to be able to park at Eastgate Square or Fortino's on Dundurn and quickly be whisked to the stadium via LRT? Why the football team has ignored this plea from their season ticket holders is baffling. Still, it's not too late to exercise some of the responsibility that surely comes with massive public subsidy and institutional presence in this town, by vocally pushing for great multi-modal connections to Tim Hortons Field. The Cannon/York cycle track, and its planned eastern extension through the stadium district, offers another safe alternative for folks arriving to the stadium. Every person who jumps aboard one of these new convenient options frees up road space and parking spots for those driving to the game. As is always the case when good options are presented to the public, everyone wins. The city and school board continue to play Sim City with the various parcels of land around the stadium, yet every proposal to come forward so far is lacklustre and old-school at best. During the stadium precinct planning process, the neighbourhood has clearly stated that enhancing the public realm and bringing the community together are priorities. Let's create mixed-use facilities around this area, as opposed to box-walled stand-alone recreation centre or school facilities that do nothing to achieve the community goals. Whatever public facility ends up being built across Cannon Street from the stadium should incorporate a pedestrian plaza/walkway from the LRT station on King, along with street-level uses facing Cannon that can bookend the new public gathering piazza at the south entry to the stadium. Imagine a sports bar with a large patio facing Cannon. I happened to drive by the stadium on Labour Day during the game and noticed a large throng of people watching the game on the scoreboard from the public plaza. The field is sunk low enough so that it isn't visible from the street, but people clearly liked the idea of watching the game with a view of the big screen and the fans on either side. It's as close as you can get to 'being there' without actually being there. With creative encouragement from the team and ground-floor amenities across the street on Cannon, this could become a popular place to hang out during events, and yet still be a welcoming spot for a bite to eat for local residents, students and rec centre users the rest of the year. Perhaps a grocery store, pharmacy or cafe could be lured into new street-facing retail space on Cannon as well, helping to fulfill one of the visions for this site to be used and busy 365 days a year. 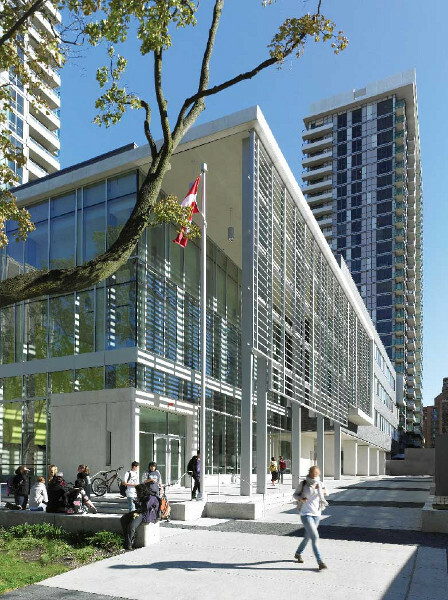 We could also explore a public-private parternship which could include condos and apartments above the school or rec centre and parking housed underground, or at least in the lower levels of the building, not facing the street. Adding the new top-notch community park in this area along with school and rec centre means the potential is here for a very busy neighbourhood and many opportunities for residents to gather and enjoy this new district. Ideas have been floated for a farmers' market, food trucks, interactive water fountains and skating rink on the new stadium piazza. Let's push for integration with LRT and mixed uses in the new public facilities so this can truly become a development that ends up achieving its initial goals of being a catalyst for city-building and neighbourhood enhancement. "How great would it be for Mountain, Dundas and Stoney Creek residents to be able to park at Eastgate Square or Fortino's on Dundurn and quickly be whisked to the stadium via LRT?" Oh, you mean like the shuttle that runs from University Plaza in Dundas to the stadium, that's free on game day? I've taken the shuttle for years to the game. It's fast, convenient, and fun. The ride home, not so much.. they need to do better at dealing with overcapacity shuttles with people crammed in like human sardines. Since the LRT was never going to go into Dundas, how would LRT benefit those in Dundas, on the mountain, Ancaster, etc? As mentioned above, park and ride would benefit people everywhere. And LRT is planned to go to University Plaza in Dundas, as well as 4 other lines connecting everywhere from Ancaster to the south/central Mtn and Stoney Creek. A heavily subsidized, free shuttle shouldn't be our long-term plan for moving around the city or attending sporting events. Thanks, Jason. I was speaking more to the only real LRT that has been committed to, which is McMaster to Eastgate. Sure, going from University Plaza to Mac is only a few extra minutes, but it would involve parking on the street, in a parking lot, and paying. When I park at the Plaza, I just pull up, lock the car, and hop on the bus. I also did some searching for who actually pays for the bus on game day. All I could find was on the Ticats site saying it's provided by the HSR, in partnership with the team. The HSR site nor the city's site didn't bring up anything meaningful. And if the LRT does ever come into existence, would it be free on game day? I think this is a great way to introduce people in the suburbs to riding public transit. I don't take transit with any regularity save for the shuttle to the stadium, but it does make me think that if we had a coherent bus schedule in the suburbs I'd be tempted to take it more. I agree that free transit for events like this is a good way to introduce people to transit. Which I wold see huge value in with an LRT system since it would be a normal, everyday part of the city's transit system. I'm sure most folks who use the free shuttles to TiCat games enjoy them, but I'm sure none of them even consider using the normal HSR service the next day for work as it's mostly slow, cumbersome and adds hours to your day. Off topic, but I think Hamilton could streamline many of it's current routes without adding a single bus or driver and serve the population more efficiently and with a faster service. We don't need stops 1 block apart like we see so often. Or meandering routes through residential neighbourhoods when local arterial roads are a more direct and faster route. Add to the current system some express bus routes along with the first LRT line and many people will start to use it as part of everyday life. I'll agree with you on your off-topic points. I don't live near a direct stop, I'm about 10 minutes by foot. But I'll fully agree - there's no need for stop after stop when they are 1-2 blocks apart, and definitely no need to have them running through neighbourhoods. Picking major intersections or high density areas makes the most sense - logically and financially. I realize in Hamilton we'll need some routes through neighbourhoods like the #3 Cannon and portions of the #5 Delaware, but think of the opportunities to use our mostly gridded street network and combine some routes with the same frequency at all times. Possibilities are endless. Think of current routes like the #41 or B-Line that connect various points of the city. Eliminate some stops and use the most direct route possible. Now, take routes like the Upp Wentworth/Wellington. Why not extend it down King to Mac or even Dundas as a merged route with one of the many #5's? This was the idea behind extending the #8 York along the entire length of Dundurn St. Unfortunately the city refuses to put a pedestrian signalled cross-walk at York and Strathcona, which caused concern among the seniors population in Strathcona who demanded the #8 continue to wind and weave it's way through the narrow streets in the neighbourhood instead of just using York and Dundurn. Then of course, folks who live NW of York/Dundurn found out they'd be losing transit and rightfully flipped out. So, no improvements have yet begun on this route all because we won't install a signal at York/Strathcona to make it safe for people to cross. All that aside, the concept of using York and the full length of Dundurn is exactly what we need to be looking at system-wide. Exactly. The extreme case I've always thought about is the city killing the 1 and routes 5 through 9 in favour of a series of short-loop north/south routes that interact with their closest B-line stop. Name each bus for it's neighborhood or major street - a Dundurn route, a Westdale route, a Dundas route, etc. that don't drive all the way to downtown. Without much thought, I wonder why the upper James bus (or any other bus for that matter) doesn't go up and down the Claremount. Instead it crosses Inverness and down the Jolly that just about every mountain bus uses. I wonder a lot of things about the HSR. You'd have to find the person who laid out the routes the last time they were updated in 1974 and ask them. Hey, got anything beside low wage jobs? at GIC meeting Sept.4 2014 . The Hamilton taxpayers (there only one taxpayer it's you) should voice there opinion to ward counsellors and your ward HWDSB trustee of the community concerns before it goes for approval City Council meeting Sept. 10 2014 at 5.oo pm. Decision of community planning should be presented to the public. This is another example of elected officials city council and HWDSB Trustees in camera (behind close doors) without community input of original plan. Do you have any more info on this? I thought the school was going at Scott Park?? Their gobs of wasteful surface parking has to go as well. So much potential will be squandered if we allow the usual Walmart style development city hall loves. But while there is potential along Cannon and King (both near the stadium and in the blocks west and east of it), it's also worth acknowledging that there's potential along the other major artery in the precinct: Barton. A 150-metre block of homes separates it from the stadium, but reinventing that street as a dense mixed-use corridor is a worthy goal and I'm glad to see the city finally taking a serious look at that. Jason:Search City of Hamilton web site on minutes; agendas for GIC meeting Sept. 4 2014. Item 8.16 (CM 14014 report ) If City Council approves this it will encourage HWDSB to close Delta(5.6 acres)and Sir John A McDonald (6.9 acres ) and build new secondary on Scott park site (1.75 acres ?) Parkview (closed June 2014 ) sending lower city Students to this site. contact your ward councillor and ward HWDSD trustee is not creative planning for 21 ST century when other option available. They don't need that much parking. This is being used a way to add in a bit of extra parking for the Ticats, which should be a non-starter for the folks who live in the area 365 days a year. Parking is by far the biggest waste of land possible in a city, especially a mixed-use neighbourhood. The timelines should be fought by residents as well. Why wait until 2017 to build the school and rec centre? I don't buy the line that 'we don't want construction during PanAm'. Are they suggesting that all construction projects in TO will be done before PanAm with no new ones allowed to start until after the games? Again, this is a feeble attempt to waste more land for parking during PanAm. We want out of town visitors to see new state of the art facilities being built at our stadium site, not acres of gravel or temporary asphalt. Great idea. Just academic. Unless the area gets flooded with Toronto expats, no one investor will build the things you are talking about. No reason we can't put out a call for public-private partners to add housing/retail to the stadium district. He does have one beef about Hamilton — one-way streets. "Two-way brings people, stores, makes a neighbourhood," he says. "I'll be fighting for that here on Sherman." I guess that means Sherman will be converted to two-way between Biggar Avenue and Landsdowne Street. hey hey, I detect some sarcasm there. Easy tiger. They'll convert Sherman in it's entirety eventually. It'll just be done 2 blocks at a time over the next several decades. Don't be so impatient. This is a complicated change. It's not like we have two-way streets all over the place in Canada from which to learn from. Give them time. I think it's a great opportunity for a public-private partnership. Everything proposed is being built with tax money. Let's leverage that and partner with the private sector to add in housing and retail to the neighbourhood.